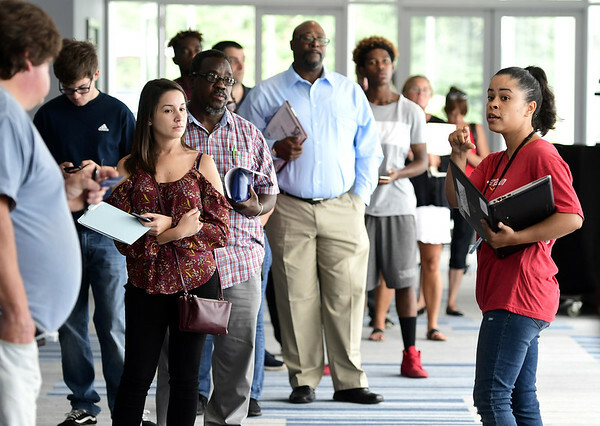 BRISTOL – Applicants to Amazon’s new delivery stationed lined up out the door at DoubleTree by Hilton Friday for their shot at filling one of 187 initially available positions. 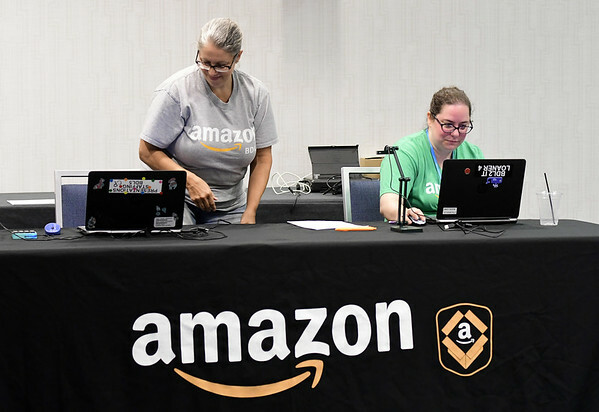 Amazon representatives sat down with applicants, helped them fill out applications, choose the shift they wished to apply for and completed consent forms for background checks and drug testing. The majority of positions sought were for the 1 to 8 a.m. shift at the station at 71 Horizon Drive. Zack Paradis said that he saw potential for growth at Amazon and decided to apply. “I would love to be part of the team,” he said. Joshua Sherman said that applying to Amazon seemed like the “perfect” job opportunity. Gilbert Pelletier said that he read about Amazon hiring in the newspaper and decided to come and apply. Gavin Macrane said that he was had previously worked at factories and warehouses and that he had a lot of experience working in a similar environment to what Amazon wanted. “I’m excited that they came here,” he said. Mayor Ellen Zoppo-Sassu and Justin Malley, executive director of the Bristol Development Authority stopped by the walk-in hiring event and were pleased by the turnout. Zoppo-Sassu said that the turnout was “great.” She re-iterated what she said at Wednesday’s City Council meeting when it was announced that Amazon would be coming to Bristol. At Wednesday’s meeting, Zoppo-Sassu said that she and the Bristol Development Authority had been working for the past three months with Amazon Logistics to ensure Amazon’s long-term success in Bristol. The City of Bristol first had talked with Amazon back in September of 2017. Amazon, at the time, had put out a request for proposal for sites for their new headquarters, according to city meeting minutes. The Bristol Development Authority, during their Sept. 25, 2017, meeting, unanimously signed off on a package that proposed Centre Square, the Southeast Bristol Business Park and 894 Middle St. as potential sites. “Bristol didn’t meet all of the company’s goals for their new headquarters, but we wanted to get a piece of the pie,” said former mayor Ken Cockayne. Brian M. Johnson can be reached at 860-873-1806 or bjohnson@bristolpress.com. Posted in New Britain Herald, Business on Friday, 17 August 2018 17:17. Updated: Friday, 17 August 2018 17:20.